(35x27) Mens Vintage 70s Wool Disco Pants! Orange, White, Yellow, Dark Brown & Black Plaid! 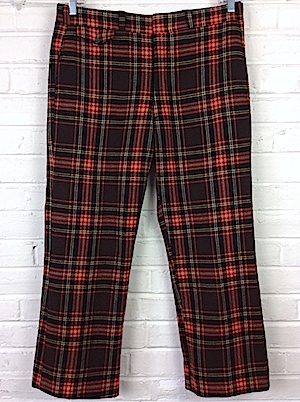 Home > Items just added 4/3-4/17 > (35x27) Mens Vintage 70s Wool Disco Pants! Orange, White, Yellow, Dark Brown & Black Plaid! 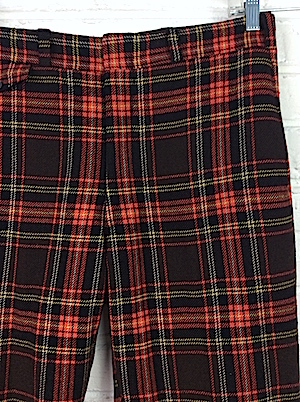 Mens Vintage 1970s wool disco pants! 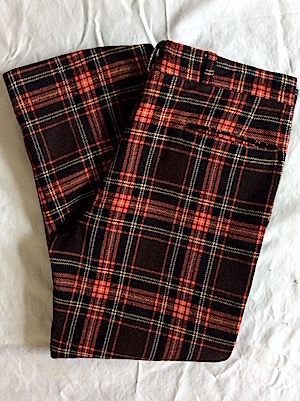 Wild and crazy orange, white, dark brown, yellow and black plaid wool disco pants. Closes in the front with a double hidden tab closure and hidden interior button for a more secure fit. Two classic pockets and one smaller "stash" pocket with a flap and button closure in the front and two interior pockets in the back, one with a button closure. Has extra thick 70s belt loops. Pants are fully lined in a white cotton. Tagged The Chaucer Collection by Saint Laurie. No material tag, but feels like 100% wool.